A thug who left a Cottingley man scarred for life after hacking his arm with a machete following a row about a dog fight has been jailed for ten years. Victim Steven Croker raised his right arm to protect himself as Nathan Seaward raised the machete above his head, Leeds Crown Court heard. 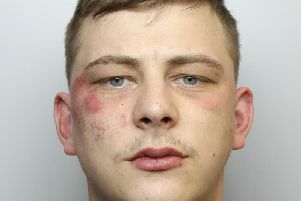 The 12in bladed machete struck Mr Croker’s arm twice during the incident on the doorstep of Croker’s home in Cottingley on the afternoon of June 12. He suffered two deep wounds, had to undergo plastic surgery and may never regain full use of the injured arm. Prosecutor Heather Gilmore, said Seaward, 25, of Dulverton Place, Cottingley, was angry because earlier that day his partner Amy Gidman’s Staffordshire bull terrier and Mr Croker’s dog had been involved in a fight in Cottingley. Gidman’s dog, which had not been on a lead, lost an ear in the fight. Gidman attacked Chelsea Brockman, who had been looking after Mr Croker’s dog at the time. Mother-of-two Gidman, 26, also of Dulverton Place, Cottingley, grabbed Miss Brockman by the hair and dragged her to the ground and kicked her on the arm. Miss Gilmore said Gidman had two kitchen knives in her waistband and passed one to Seaward as they walked to Mr Croker’s home. Seaward admitted wounding with intent to cause grievous bodily harm, possessing an offensive weapon, possessing a bladed article and affray. Gidman admitted assault, affray and possessing a bladed article. Seaward has a string of previous convictions starting with a conviction for common assault when he was 14-years-old. He also has previous convictions for robbery, possessing a firearm, criminal damage, battery and wounding. Judge Marson added: “Steven Croker had to have plastic surgery to his wounds. He will be scarred forever. He still has difficulty using his hand and arm. There is no certainty he will ever fully recover. Judge Marson jailed Gidman for 16 months. And he imposed a restraining order, banning Seaward and Gidman from contacting Steven Croker and from entering Cottingley Estate.